BARRANQUILLA, Colombia – The top international baseball competition of 2018, the WBSC U-23 Baseball World Cup®, will be staged in the South American city of Barranquilla, Colombia, from 19-28 October. Amid the excitement of the 2018 Central American and Caribbean Games in Barranquilla, the World Baseball Softball Confederation today announced that the hosting rights of the U-23 Baseball World Cup 2018 have been awarded to the Colombian Baseball Federation (FCB) in conjunction with the city of Barranquilla and the Atlántico Department. The newly inaugurated US$ 33 million, 12,000-seat Edgar Renteria Baseball Stadium will serve as the centrepiece of the U-23 Baseball World Cup 2018. The state-of-the-art stadium is being called the “Jewel of the Central American and Caribbean Games” and has taken on the role of South America’s premier baseball venue. Located approximately 100 kilometres south of Barranquilla, games of the U-23 Baseball World Cup will help to inaugurate new baseball stadiums in Repelón and Manatí, which are part of an US$ 8 million investment in sport by Colombia’s Atlántico Department. Barranquilla’s Santa Marta Baseball Stadium will serve as a main venue. The official venue plan will be confirmed following stadium inspections by the WBSC. Nicaragua was originally awarded the hosting rights of the U-23 Baseball World Cup 2018. Given the current climate in Nicaragua, WBSC and the Nicaraguan Baseball Federation agreed that WBSC would reassign the rights. As host, Colombia’s U-23 National Baseball Team has been granted a wild card and is the 12th and final team to enter the race for the U-23 world title. 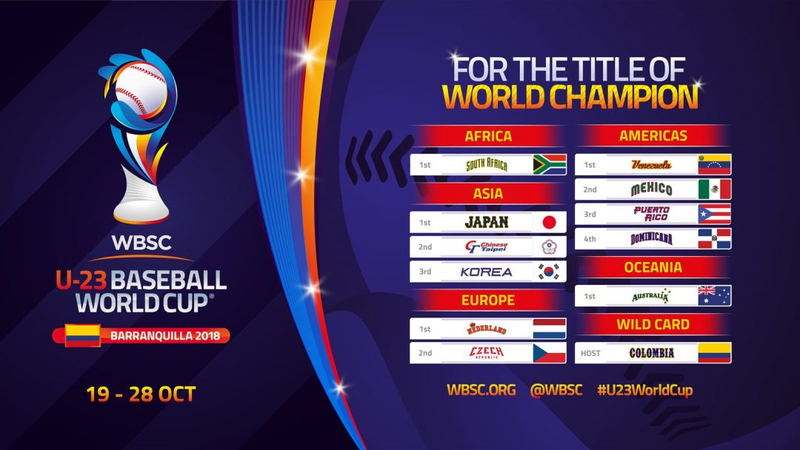 The WBSC U-23 Baseball World Cup will be the top international baseball tournament in 2018, distributing 690 points toward the WBSC Baseball World Rankings — the third-largest award, following the major international competitions Premier12® and the World Baseball Classic. At the last U-23 Baseball World Cup in 2016, National Team rosters included players from clubs affiliated to the Australian Baseball League, Chinese Professional Baseball League, Korean Baseball Organization, Major League Baseball, Mexican Baseball League, Nicaraguan Professional Baseball League, Nippon Professional Baseball, in addition to other leagues around the world.